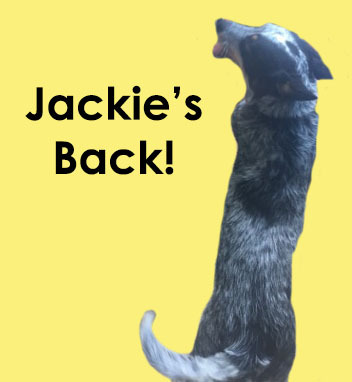 JACKIE’S BACK FROM HER W.E.B. 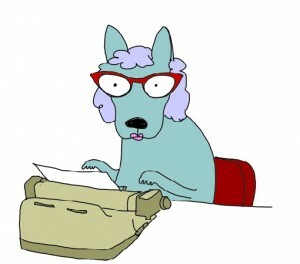 Media Watch Dog went on what many journalists like to call a Well Earned Break (W.E.B. for short) at the close of business on Friday 14 December 2018. This contrasts with the ABC TV Media Watch program (host Paul Barry whose presence continues the program’s reality as a Conservative Free Zone without one conservative or right-of-centre presenter in its three decades history) which signed-off on 10 December 2018 and will not return until 4 February 2019. Its W.E.B. was of some seven weeks. Your taxes at work – or, rather, not at work. Meanwhile ABC TV Four Corners’ W.E.B. went for a whopping eleven weeks – having last gone to air on 12 November 2018 and resuming next Monday. Meanwhile Sky News’ key programs returned last Monday after a relatively short W.E.B. MWD has been collecting material during what some still regard as the Silly Season – since, during this time of the year, some media types are sillier than usual. This will be fed into MWD over forthcoming weeks – as time and space allows. Also, from time to time, MWD will look back in happiness at some of the most egregious howlers of 2018. Gerard Henderson – Jackie’s (male) co-owner – has already covered some of last year’s hyperbole and false prophecy in his Weekend Australian column on Saturday 29 December 2018. There is more to come. And now – Jackie’s Back. Norman Hermant: But some participants like Ella Buckland dispute that. After she was moved on to ParentsNext, she lodged a petition that now has more than 20,000 signatures. Her participation plan includes mandatory swimming lessons for her daughter. Ella Buckland: The idea that, you know, an organisation [like ParentsNext] can force me to take my child to swimming lessons which I was already doing and paying for, but then they can also ring and check up on me. I mean, that doesn’t make me feel very good. It doesn’t make me feel confident, or like I’m doing a good job as a parent. It makes me feel like I’ve done something wrong. What Mr Hermant did not say is that Ms Buckland is more than a “parent” who is critical of the Coalition government. She is also a political operative who has been prominent in the Greens in NSW. Some AM listeners would like to know this. Leigh Sales, Presenter: In literary circles a huge bomb has exploded this week at the respected Melbourne University Publishing (MUP). Yesterday high-profile CEO, Louise Adler, resigned along with four board members in protest at a decision by Melbourne Uni’s new vice-chancellor taking the company in a radical new direction. MUP has published some of Australia’s most significant political books in the past 15 years including Battlelines by Tony Abbott and Triumph and Demise by Paul Kelly. As Madeleine Morris reports, the fallout is far from over. Ms Sales concluded the segment by declaring, “in the interests of complete transparency”, that she has published two books with Louise Adler. Fair enough. It’s just that 7.30’s report was not completely transparent. Madeleine Morris interviewed three critics of the decision – former NSW Labor premier Bob Carr, former MUP chairman Laurie Muller and the Victorian Labor government minister Martin Foley. ABC Radio AM did much the same on Thursday when it interviewed MUP authors Louise Milligan, Jane Caro and Bob Carr. No one made it to air who was willing to defend the decision. What both 7.30 and AM missed is revealed by Robert Bolton in today’s Australian Financial Review and by Rachel Baxendale in today’s Australian. MUP received a total of $26 million in subsidies from the University of Melbourne over the past 15 years. This works out at about $1.7 million a year. If MUP under Louise Adler’s management has been as successful as the likes of Bob Carr, Laurie Muller, Martin Foley, Louise Milligan and Jane Caro contend – then why did it need so many subsidies over so many years? The line run by both 7.30 and AM is that Melbourne University chancellor Alan Myers QC moved against MUP under Louise Adler’s management because it published a book about one of his clients, a prominent Australian. Melbourne University denies this. However, many serious reviewers attacked the book saying it contained numerous factual errors. Moreover, it is replete with poor scholarship with respect to the presentation and judgment of evidence – including the construction of quotations and the use of anonymous sources. Despite the concern of the ABC, such authors as Paul Kelly, Jane Caro, Gillian Triggs and Bob Carr will not have any problems finding a publisher for their books. It stands to reason that journalists who work at the taxpayer funded public broadcaster might have a different attitude to the receipt of subsidies than their commercial counterparts. However, the former vice chancellor of Melbourne University Glyn Davis and his successor Duncan Maskell have acted professionally in seeking to move MUP in a new direction. Even if it means that the subsidised MUP company may no longer publish such tomes as I, Mick Gatto which is co-authored by colourful Melbourne identity Mick Gatto. Disclosure. Gerard Henderson’s most recent book Santamaria: A Most Unusual Man was published by MUP in 2015 in its The Miegunyah Press series. He did not seek – and did not receive – an advance. The print copy of Santamaria sold out and now the biography is available as an e-book and a Print On Demand (POD) publication. So Gerard Henderson was not a direct recipient of any benefits of the subsidy received by MUP from the University of Melbourne. On 5 January, the Sydney Morning Herald ran a column titled “The best of the Fitz Files” – presumably Peter FitzSimons was on a well earned break somewhere or other and so his Saturday columns went into “best of” mode. The dinkus carried a pic of your man Fitz wearing his come-look-at-me Red Bandanna. The column was headed “How to read classic behaviour in a game touched by the hands of prima donnas”. Yes, prima donnas. It was a critique of the tendency of some international football (aka soccer) stars to engage in attention-seeking behaviour on the field. Written by an exhibitionist who wears a red rag on his head. Can You Bear It? While on the topic of attention-seeking – remember the feisty leftist Jane Caro who wrote a column in The [Boring] Saturday Paper last October titled “Running against Tony Abbott in Warringah”? As MWD predicted, the dual Australian-British citizen, who does not live in Warringah, has now announced that she will not contest Tony Abbott’s seat at the Federal election which is likely to be held in May. Quelle surprise! Jane Caro: Well hey, here’s a radical idea – actually it’s not that radical because Bob Hawke’s been going on about it since 1979, I think. Why not get rid of the States altogether? Let’s go and have large municipalities and local governments that are close to the ground and a national government – instead of having States at all. Let’s merge every State with one another so that we just have Australia. What a load of absolute tosh. The abolition of the Australian States – if it is constitutionally possible – would require a change in the Australian Constitution. Is Ms Caro seriously suggesting that four or more of Tasmania, South Australia, Western Australia, Queensland, Victoria and New South Wales would vote to abolish themselves and hand over power to the national government in Canberra? She seems unaware that constitutional change requires a national majority along with a majority in a majority [i.e. four] states. This is what passes for high level intellectual discussion on The Drum. Can You Bear It? While on the topic of false predictions, did anyone see the Sydney Morning Herald front page on 14 January which carried this header: “CBD: Credlin gets to take a seat.”? Turn to Page 2 and the news was not quite so strong. Nine’s CBD columnists Kylar Loussikian and Samantha Hutchinson – both of whom were recruited from News Corp newspapers – wrote a piece titled “Be seated: Credlin weighs her options.” The CBD pair speculated that Peta Credlin might contest the seat of Mallee at the next election – or perhaps the seat of Menzies – or perhaps she might not be suited to life as a politician. In short, the CBD report was a no-news story especially designed for the Silly Season. Can You Bear It? Sara James is one of a score or more of regular ABC commentators who resent Donald J. Trump and all his works and all his pomps – to a greater or lesser extent. Ms James, an experienced journalist and American by birth, is more balanced than most of the ABC journalist/commentators who opine on contemporary United States. But she is certainly not the proud owner of a red Make America Great Again (MAGA) cap. Lisa Millar: Sara, I want to have time to look at this video that’s gone viral of the Native American surrounded by Catholic teenage high school students from Kentucky – if we can see the pictures. Talk us through what was going on. Sara James: Well this gentleman, his name is Nathan Phillips – he’s an Omaha elder and he was there for an Indigenous march. And some of these students were from another march, a Right to Life march, which was for those who are opposed to Roe vs Wade which made abortion legal in America. So, these, as you see, some of these teens are wearing the MAGA hats – Make America Great Again. And Nathan Phillips said he really felt concerned and alarmed there, he continued to go on with his song. I should point out that he is a Veteran, he was a Veteran of Vietnam, the Vietnam War. So, this has gone viral, the school has said that they will look into it and that many options are on the table including expulsion. Lisa Millar: It’s this shot here that bothers me the most, I think. That, you know, he’s sort of staring in his [Nathan Phillips’] face trying to – it would appear that he is trying to intimidate. Michael Rowland: And it’s pure hate. Michael Rowland: There are no other ways around it. Sara James: Well, you know, I think what’s the worry in America right now is the grown-ups are fighting. And it’s like a case of the flu and the kids are catching it. And the United States, like Australia, the United States is a phenomenally multicultural country. And we cannot afford this kind of stuff. Sara James: And two years where immigration has been the signature issue for this President and this presidency. So, I think that that is the connection and it will roll on. Michael Rowland: You know where I’d build a wall, Sarah? Sara James: Where would you put that wall? Michael Rowland: Right around that college. Stop those kids getting out into the public. Sara James: Well, you know, I think the reality is to, let’s look even a bit more broadly than those kids. I mean, I think what we’re looking at is a toxic situation in the United States right now. And I think that everybody needs to figure out ways to talk about openness and togetherness and how everybody gets along. What an occasion for moralising. Not only were the students conservative Catholics – but it was possible for the James/Millar/Rowland trio to blame their (alleged) behaviour on President Trump. Only problem is that everything was “true” in the story – except for, er, the facts. Within a few hours of the Sara James story going to air, ABC News Online was running a more nuanced report. The Covington Catholic High School students were waiting for a bus near the Lincoln Memorial when they were confronted by radical Black Israelites who verbally abused them, including using racial and homophobic taunts. The students held their ground and started to sing school songs. It was then that Nathan Phillips approached the students and commenced beating a drum in the face of one student – Nick Sandmann. Nick Sandmann ended up staring at the aggressive Nathan Phillips. That’s all. That is what Michael Rowland described as a manifestation of “pure hate”. ٠ The students did not surround Nathan Phillips. ٠ Nathan Phillips did not serve in the Vietnam War. ٠ Nick Sandmann did not attempt to intimidate Nathan Phillips by staring at his face. The student merely held his ground as Mr Phillips confronted him by banging on a drum close to his face. ٠ Any claim that Nick Sandmann exhibited “pure hate” towards Nathan Phillips is an entirely subjective assertion unsupported by facts. ٠ It is Trump-phobia wishful thinking to assert that what occurred near the Lincoln Memorial had anything to do with President Trump. Except that some of the students were wearing MAGA hats popularised by the man who was elected president of the United States in November 2016. Now, anyone can make errors on live television – especially when making assumptions on the basis of incomplete evidence. The problem is that the ABC is most reluctant to apologise for errors – or even to make corrections. On Tuesday, Gerard Henderson emailed Michael Rowland, pointing out initial reports out of the United States, which Sara James had taken up, had been “completely discredited with reference to footage taken at the event”. Mr Rowland did not respond – but flicked the matter to News Breakfast producer Emily Butselaar. Yesterday, Ms Butselaar emailed Gerard Henderson – and threw the switch to denial. She maintained that no correction on News Breakfast is required concerning the coverage of Covington Boys High School since “the discussion fell well short of a factual statement”. Really. Emily Butselaar also claimed that the James/Millar/Rowland discussion “was clearly an interpretation of an ambiguous incident”. Really. How about that? 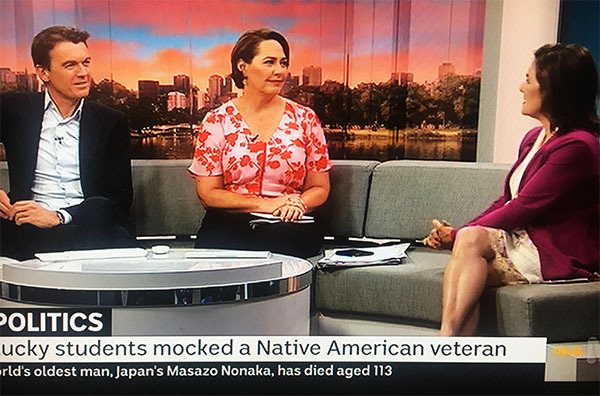 News Breakfast’s producer is claiming that Michael Rowland’s assertion that Nick Sandmann exhibited “pure hate” towards a Native American was merely “an interpretation of an ambiguous incident”. Turn it up. So there will be no correction of the false response of the Covington Catholic High School report on News Breakfast. However, in the US many of the news outlets which carried the fake story have corrected the coverage and apologised to the young students. That’s your taxes at work at the taxpayer funded public broadcaster. Disraeli is said to have commented that everyone loves flattery but when it comes to the Royal Family you need to lay it on with a trowel. MWD is on constant flattery watch – and is conscious of the saying that imitation is the highest form of flattery. Hence the introduction of this new segment which will monitor literary re-cycling in the media. In his column in the Sun-Herald last Sunday, Peter FitzSimons wrote a piece in which he predicted that Independent Zali Steggall will defeat Tony Abbott in the election for the seat of Warringah on Sydney’s North Shore. His conclusion was as follows: “You heard it here first. Tony Abbott has met his match and her name is Zali Steggall.” MWD is not into prophecy and is happy to await the decision of the good people of Warringah. @jimmyraynes Congratulations to Warren Mundine, the first rat to run ONTO a sinking ship. The reference was to former Labor Party national president Warren Mundine’s decision to join the Liberal Party and contest Gilmore on the NSW South Coast in the 2019 election. The joke is that he is a “rat” (the term used by the Australian Labor Party to describe those who leave its ranks) who is swimming on to a sinking ship. Get it? Rats usually abandon a sinking ship – if they can. How funny is this? Well, no longer funny since it’s re-cycled so often. And not at all original. Hendo reckons that he first heard this joke in 1975 – nearly half a century ago. But he has been advised that the joke is at least a century old. According to one report, Winston Churchill said in 1920: “It is the only time I have ever seen a rat swimming towards a sinking ship.” The reference was to a fellow Liberal parliamentarian who crossed the floor in the House of Commons. So the Red Bandannaed One is attributing a joke to a certain @JimmyRaynes which was original and funny a hundred years ago. A clear case of Literary Recycling. Congratulations to Warren Mundine, the first rat to run ONTO a sinking ship. James, that has to be your best yet. Gold. Ha, Ha indeed. But what about thanking Winston Churchill who first made the joke? – around the time when Moses was in short pants. As avid readers are aware, the late Nancy (2004-2017) did not die. She merely “passed” on to the Other Side. Hence MWD has been able to keep in touch with her – with the help of the American psychic John Edward of Crossing Over fame. And so, Nancy’s “Courtesy Classes” continue – albeit from the “Other Side” – Nancy’s wise counsel is communicated to those living in this Vale of Tears by Jackie (Dip. Wellness, Gunnedah Institute). On Wednesday, Kate Roffey got the “Newspapers” segment gig on ABC TV’s News Breakfast – Michael Rowland and Lisa Millar were the presenters. The psychologist, who holds the pretentious title of Director – Deals, Investment & Major Projects at Wyndham City Council in Melbourne’s west, is a regular on the taxpayer funded public broadcaster. Ms Roffey ran the familiar line about Brexit which is constantly heard on the ABC – namely that a “no deal” on Brexit would be a disaster for Britain. Maybe it would be – maybe not. But she failed to recognise that if Britain leaves the European Union without a deal – this will also have serious adverse consequences for the European Union. Particularly such nations as Germany and the Netherlands which trade heavily with Britain and are two of the strongest economies in the EU. But MWD digresses. Earlier in her discussions about the day’s newspapers, Kate Roffey twice referred to Prime Minister Scott Morrison as “ScoMo”. Really. In fact, she used no other term to refer to Mr Morrison. So an overseas visitor, who arrived in Australia early on Wednesday and switched on ABC TV, could well have got the impression that Australia’s prime minister is a man with the surname of “ScoMo”. As in “Good Morning, Mr ScoMo”. How discourteous is this? Kate Roffey is a well-connected business woman who should understand that the appropriate reference for Scott Morrison is either “Prime Minister” or “Mr Morrison”. Likewise with Julia Gillard when she was prime minister – her proper titles were “Prime Minister” or “Ms Gillard”. I suggest that Ms Roffey enrol immediately in my Courtesy Classes. In the meantime, I wonder how people are addressed by Ms Roffey at the Wyndham City Council down Werribee way. Journalists invariably present themselves as a cynical/sceptical lot. Except when it comes to their own profession. Which explains why every couple of months or so the leading media types in the land like to get dressed up in their finest and present each other with awards. You know, the Quill awards and the Walkleys and the Australian Media Hall of Fame and so on. Why, in 2016, even hard-nosed Laurie Oakes rocked up to receive his gong at the Media Hall of Fame. Inspired by this momentum, Jackie (Dip. 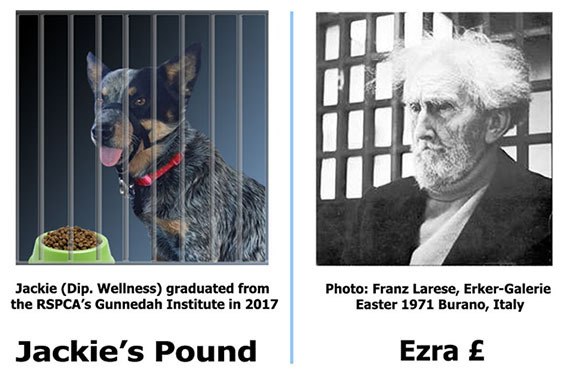 Wellness, Gunnedah Institute), decided to initiate her very own awards last year – they continue this year. Join with MWD as we Look Back in Amusement at the Media Stars of 2018 over the next three months or so. One by one. The Flann O’Brien Gong is inspired by the Irish humourist Brian O’Nolan (1911-1966) – nom de plume Flann O’Brien – and, in particular, his critique of the sometimes incoherent poet Ezra Pound. Your man O’Brien also had the good sense not to take seriously Eamon De Valera (1882-1975), the Fianna Fail politician and dreadful bore who was prime minister and later president of Ireland. The Flann O’Brien Gong for Literary or Verbal Sludge is devoted to outing bad writing or incomprehensible prose or incoherent verbal expression or the use of pretentious words. On Wednesday 29 August 2018, shortly after Malcolm Turnbull lost the support of a majority of Liberal parliamentarians and resigned as Prime Minister, ABC Radio National’s The Minefield program discussed the topic “What’s wrong with Australian democracy?” The presenters were Waleed Aly and Scott Stephens and their guest was The Guardian Australia’s political editor and luvvie-in-chief. Namely, MWD fave Katharine Murphy. Scott Stephens: Let me suggest to you though, getting more precisely to the question you raised, and that really is to my mind the most important question. It seems to me that one of the things that has happened, for one reason or another, over the last 10-12 years within Australian politics, and maybe this is something about the disposition of Australian politics, maybe this has to do with the fact that our political system is derivative rather than let’s say historically or culturally thick. It’s something that we’ve gotten from someplace else. We’ve sort of inhabited it in our own particular way. One of the things I think that has happened is that one of the essential goods of modern representative democracy, one of the unquestioned goods of modern representative democracies, has effectively been not so much jettisoned but we’ve lost the sense of the goodness of it. We’ve lost the sense of our faith in it. And that is the good of stability. Not stability for stability’s sake. I mean I would be the last person in the world to say that stability within certain political conditions that might be unjust, that might be intolerable, where there is a kind of palpable injustice or inequity. I don’t think that stability is an end in itself to use the Aristotelian term. But, one of the things that the embrace, the acceptance of the goodness of stability does is it accepts the fact that representative democracies have a two way or a two-directional role. One of course is to represent the people that elect or they give legitimacy to the elected politician. But the other thing that representative democracy does is it reflects back, in a kind of pedagogical sense, to the electorate the best form, the best version, the best expressions of themselves, of their desires of their wishes. In other words, what stability does is it models at a central centralised level it models the type of communal bonds, the mutual deference the willingness to express toleration, to be fair, to have a degree of detachment from one’s fiercest beliefs, to exercise forms of self-doubt and compromise, to engage in a degree of playfulness even with other human beings. It allows those virtues within a democratic society to be put on display and then to be reflected back to people who may live in varying degrees of isolation or move from one another. So what stability does, what political stability does, is it actually displays the very virtues that ought to exist within in a community in political conditions of where those communal bonds no longer function because of the size of the population, because of our distension, because of our geographical spread. And so I think it’s that, it’s that faith that stability as such is a good thing. It’s good pedagogically and it’s good for the instilling of certain crucial democratic virtues. That, it seems to me, is precisely what has been jettisoned. And when stability goes, when those moderating, tolerating, self-doubting virtues go along with it, then unfortunately what ends up filling up the space, is a certain political egotism, that no longer, that sacrifices if you like, stability. So intense was the Scott Stephens rant-to-microphone that Doctor Aly (for a Doctor he is) and Comrade Murphy let him go on and on and on. On Thursday 21 January 2019, Prime Minister Scott Morrison announced that former Labor Party national president Warren Mundine will represent the Liberal Party in the marginal seat of Gilmore at the forthcoming Federal election. This immediately fired up Nine (formerly Fairfax Media) print journalists (pace Kate McClymont) and ABC journos (pace Laura Tingle) – who threw the switch to sneering ridicule with respect to both the Prime Minister and Mr Mundine. The Sydney Morning Herald’s Kate McClymont set off the sneering brigade with a sneering tweet on Tuesday 22 January. On Wednesday 23 January, Gerard Henderson wrote to the (normally) feisty Ms McClymont. Guess what? She threw the switch to “no comment” and went UNDER THE BED. Set out below is Jackie’s (male) co-owner’s correspondence – which Kate McClymont, on two occasions, declined to even acknowledge. How’s that for gutlessness? I note that you put out this tweet yesterday – following the news that Warren Mundine was to contest Gilmore for the Liberal Party in the forthcoming election. – It is unprofessional for you to attempt to ridicule the Liberal Party’s decision to endorse Warren Mundine for Gilmore on the basis that he is my son-in-law. Gratuitously bringing families into the political debate is the type of business-gossip journalism found the in The News of the World of recent memory. You, Nine and the Sydney Morning Herald should be able to do better than this. – For the record, I have never spoken to Prime Minister Scott Morrison or Warren Mundine about Liberal Party preselection for Gilmore. All I know about this matter is what I have gleaned from the media. – Warren Mundine is an experienced and articulate political operative – he did not seek and has not received any advice from me about his political career. – Your “revelation” that I am Warren Mundine’s father-in-law (which is old news) led to this anonymous tweet by “Mick Activist” followed by a tweet from a certain Dr Jillian Carroll. Yes I was thinking the same. Gerard Henderson is the INVISIBLE HAND here. What an “achievement” for the Sydney Morning Herald. Your tweet fired up “Mick Activist” to refer to Warren Mundine as a “mongrel rat son in law” and for Jillian Carroll to conclude that I determined the Gilmore preselection. This gives FAKE NEWS a bad name. Ps I note that yesterday the Sydney Morning Herald gave considerable publicity to Alice Thompson’s expressed intention to run against Tony Abbott in Warringah at the election. The SMH declined to advise readers whether or not Alice Thompson lives in Warringah. So it seems that there is one rule for Mr Mundine and another one for Ms Thompson. An unpleasant double standard, to be sure. On Wednesday 23 January, Warren Mundine was interviewed on ABC Radio Sydney 702’s Drive with Richard Glover program. Mr Glover essentially put it to Mr Mundine that his decision to leave the Labor Party and, some years later, join the Liberal Party was about social climbing or some such. The ABC presenter overlooked the fact that while Mr Mundine has changed his party allegiance in recent years, his political views have not altered much in a decade – especially with respect to the importance of employment for Indigenous Australians. Gerard Henderson queried Mr Glover about a personal reference he made on the program about Hendo himself – and the usually assertive ABC presenter soon threw the switch to denial. Now read on. I was walking Jackie last evening while listening to your interview with Warren Mundine. I was surprised by tone of some of your questions/assertions – which seemed to reflect Kate McClymont’s twitter rant of the previous day. I have not discussed the interview with Warren [Mundine] and Elizabeth [Henderson]. But it is my recollection that you suggested to Warren that he married Elizabeth as part of his change of political direction. Somewhat demeaning, don’t you think? You then went on to tell listeners that Elizabeth is my daughter – but made no reference to Anne [Henderson]. You then described me as “right-wing” but I am not “right wing”. Sure, I am conservative. In any event, you use “right-wing” as a term of abuse. Indeed you stated recently that the right-wing of the Liberal Party are maniacs (your SMH column of 22 December 2018 refers). For the record, I believe that Anne and I have got more asylum seekers out of detention than all the ABC presenters combined. And we voted “Yes” for an Australian republic. How “right-wing” is this? If you had bothered to ask me before yesterday’s program – I would have told you that I had no discussions of any kind about Gilmore with the Prime Minister, Warren Mundine or Elizabeth Henderson. Warren is an experienced political operative of considerable ability – he does not need advice from Anne or myself. You should be able to do better than this. I hope the question didn’t imply that he was your agent, or you his, or whatever. The context was Warren arguing that the Labor Party shifted while he’d stood still, so the question was about the idea that he may have shifted attitude/connections/world view a little himself. Best wishes to Anne and apologies for the lack of credit. I do realise that the production of splendid daughters involves more than the father. Best and thanks again for the help with the [The Land Before] Avocado book. ▪ Your “I’m sorry if” you were “demeaning” apology is both meaningless and directed to the wrong person. I do not need an apology from you with respect to your demeaning comment concerning Warren Mundine. You alleged that a reason for Warren Mundine’s move from the Labor Party was related to the fact that he “married the daughter of Gerard Henderson”. You know nothing about Warren Mundine’s personal motives – nor do I. It was an ignorant, offensive and gratuitous comment – which channelled Kate McClymont’s Twitter rant (which she will not defend). ▪ I am not at all sure that I am “well known” to Drive with Richard Glover’s audience. I reckon that I have been invited on/appeared on the program about twice in the past decade. ▪ It is fair and professional for you to ask Warren Mundine about his changing party political allegiances. It is neither fair nor professional for you to suggest – without a shred of evidence – that this relates to his personal life. I am surprised that you have joined The Sydney Morning Herald (Kate McClymont) & ABC 7:30 (Laura Tingle) pile-on against the endorsed Liberal candidate for Gilmore. But there you go. ▪ In conclusion, I note that you have avoided defending your assertion that I am right-wing, a position you have publicly equated with “maniacs”. Richard Glover has not given a substantial reply to any of the points made in Gerard Henderson’s emails of 24 January and 25 January. 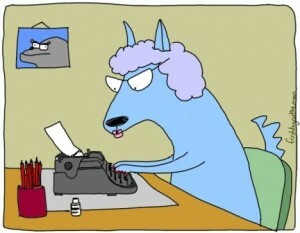 At 6.30 pm on Thursday 24 January, when packing his car prior to driving one of Jackie’s canine mates to see a man about a dog, Hendo accidentally emailed a pro-forma “Thanks for the clarification” message. Apparently your man Glover thought that he had been thanked for clarifying a matter which had not been clarified. In any event, Mr Glover threw the switch to offence and suggested that Gerard Henderson’s email of 25 January had been “a quite tart response”. Shucks. For his part, Hendo repeated his advice to the ABC presenter that it was unwise to make personal comments about matters concerning which he has neither insight nor knowledge. MWD will let you know if Richard Glover provides a substantial response to Hendo’s criticisms of his (gratuitous) interview with Warren Mundine. Don’t hold your breath.